Traffic diversions will be in place on the motorway near Naas this weekend due to the demolition of a bridge over the M7. The bridge, between Junction 9 Naas North and Junction 10 Naas South is being demolished as part of the M7 upgrade works currently ongoing. A new bridge is being built as part of the Osberstown Interchange (Junction 9a) construction. These works will take place between this Friday, March 29 and Sunday, March 31. 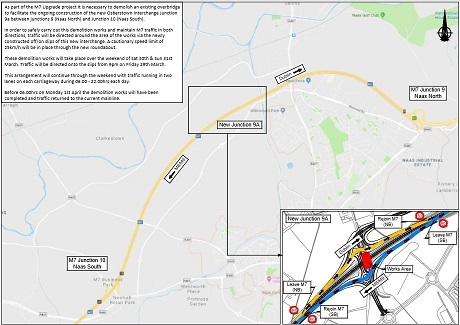 According to Kildare County Council, in order to safely carry out these works and maintain M7 mainline traffic in both directions, traffic will be directed around the area of works via the newly constructed off/on slips of the new interchange. Traffic will be reduced to a single lane on Friday, March 29, from 9pm, to facilitate these temporary arrangements. Before 6am on Saturday, March 30, traffic will be returned to two available lanes running on the off/on slips. This temporary arrangement will continue through until Sunday night, March 31, until the demolition works are complete and the main carriageway has been cleared of all debris. A minimum of two lanes will be maintained during peak hours of 6am and 10pm at all times. Delays are expected and the council says it regrets any inconvenience to the public.